Good Wednesday morning. It's Mueller Eve! President Trump tweets his 2020 prediction: "I believe it will be Crazy Bernie Sanders vs. Sleepy Joe Biden as the two finalists ... I look forward to facing whoever it may be. May God Rest Their Soul!" Was this email forwarded to you? Get your own Axios AM and PM! Sign up here. 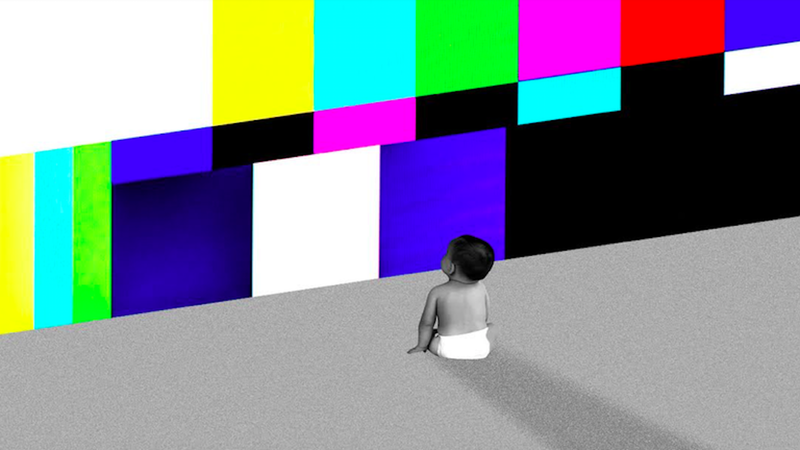 Parents are relying more than ever on digital babysitters and device-led playtime to entertain their children, making it increasingly difficult to monitor what their kids are seeing, Axios' Kim Hart and Sara Fischer report. Why it matters: This goes beyond the old challenges of kids watching too much TV. Modern parents struggle to keep up with the immense variety of kids' programming across a multitude of apps. Plus, controlling what kids are exposed to on platforms like YouTube can feel like an unwinnable battle with algorithms. Mediating what children are exposed to is getting more challenging, with the ever-increasing amount of kid-targeted content and algorithms pushing out the next piece of content, said Shelley Pasnik, director of the nonprofit Center for Children and Technology. Baby boomers and Gen-X-ers often reminisce about the days of meeting up with friends at the neighborhood cul-de-sac or mall. But today, many parents are less comfortable sending their children outside to play unattended. New in-depth reports on Facebook portray Mark Zuckerberg as a tough negotiator and shrewd wielder of power — miles from the geeky whiz kid image that kicked off his public life, Axios' Sara Fischer and Scott Rosenberg write. Why it matters: Zuckerberg controls Facebook's voting stock. And Facebook controls much of the world's information diet. NBC's Olivia Solon and Cyrus Farivar reviewed 4,000 pages of documents — including emails, webchats, presentations and meeting summaries — mostly from 2011 through 2015, leaked from the proceedings of a U.K. lawsuit brought by the maker of a now-defunct app against Facebook. The NBC story concludes that Zuckerberg personally oversaw plans years ago to use consumer data as leverage to disadvantage consumers, and that he worked with Facebook's communications team to help spin the narrative that changes to its policies were attributable to privacy concerns. 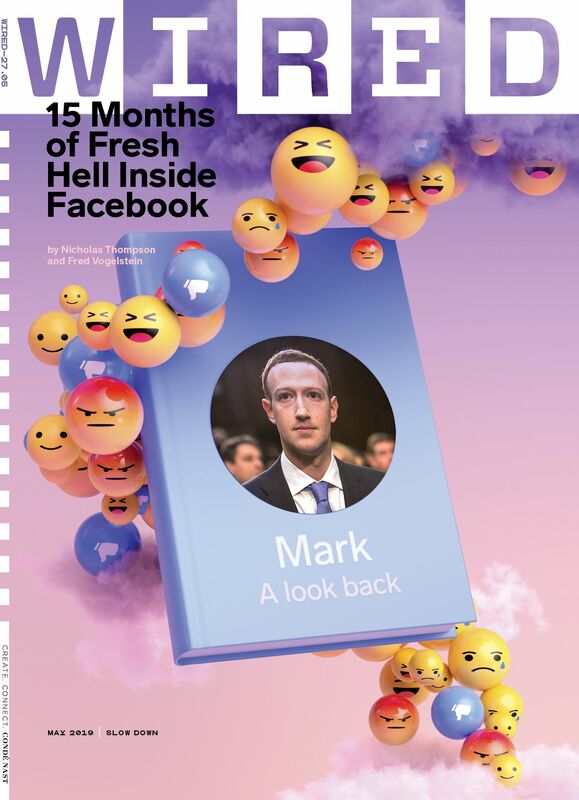 A WIRED account of Facebook's crisis-plagued last year sheds new light on the company's seeming paralysis in the aftermath of the Cambridge Analytica revelations a year ago. But also, Nick Thompson and Fred Vogelstein write: "Executives didn’t want a repeat of Zuckerberg’s ignominious performance after the 2016 election." Today, he's on a PR offensive that includes hosting a series of conversations on the future of technology and society. What's new: In the second veto of his presidency, President Trump last evening vetoed a resolution passed by Congress to end U.S. military assistance in Saudi Arabia's war in Yemen. Congress lacks the votes to override the veto, AP reports. The resolution, which invoked the War Powers Act, "was a rebuke of Mr. Trump’s support for Saudi Arabia even after the killing of the dissident journalist Jamal Khashoggi," per the N.Y. Times. Why it matters, from Jonathan Swan: Trump’s relationship with the Senate is at an all-time low in his presidency. It frayed amid the shutdown (which never had an endgame), followed by the border emergency declaration, which divided the Republican conference. That followed Trump's order of a withdrawal from Syria, which delighted Sen. Rand Paul (R-Ky.) but infuriated mainstream Republicans. We won’t overstate it: Trump has a hold over the party and remains popular with Republican voters, so lawmakers will still side with him when it counts. But acts of defiance are becoming more frequent, and should worry the White House. Above, flames and smoke rise as the spire of Notre Dame Cathedral collapses in Paris on Monday. 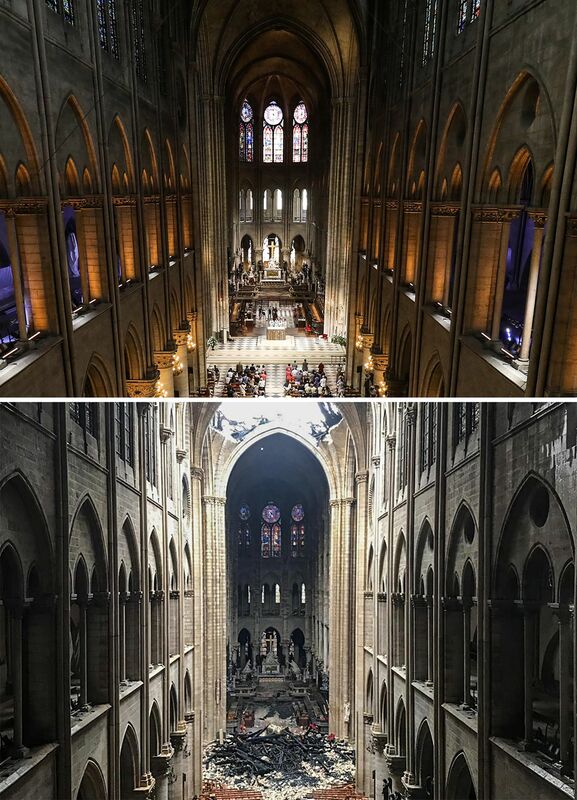 French President Emmanuel Macron vowed to rebuild Notre Dame "even more beautifully" within five years, as all of France's cathedrals prepared to ring their bells today to mark 48 hours since the colossal fire began, AFP reports. "Macron announced the speedy timescale for restoration — a process some experts had said would take decades — in an address to the nation where he [said] the disaster had shown the capacity of France to mobilize and unite." P.S. 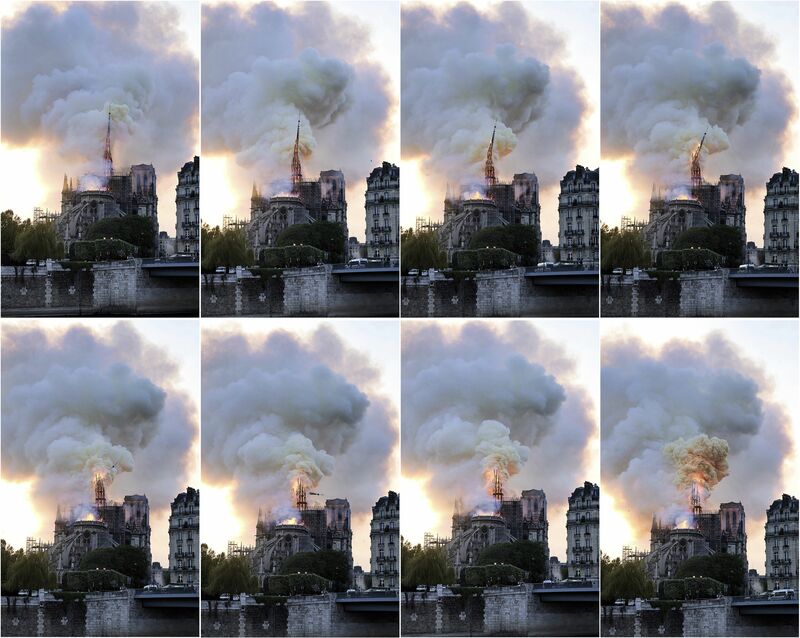 ... "$1 billion raised to rebuild Paris' Notre Dame after fire," per ABC News. Above, worshippers arrive for mass at the cathedral on June 26, 2018. Below is the same view in the aftermath of the Holy Week inferno. The iPhone age is providing a new form of intelligence for political reporters, who used to depend on whispers about a secret campaign launch. Joe Biden was recently spotted at his childhood home in Scranton, Pa., obviously taping a commercial for a campaign launch that's expected after Easter. And we can tell you about another imminent announcement. The photo above is Rep. Seth Moulton (D-Mass.) 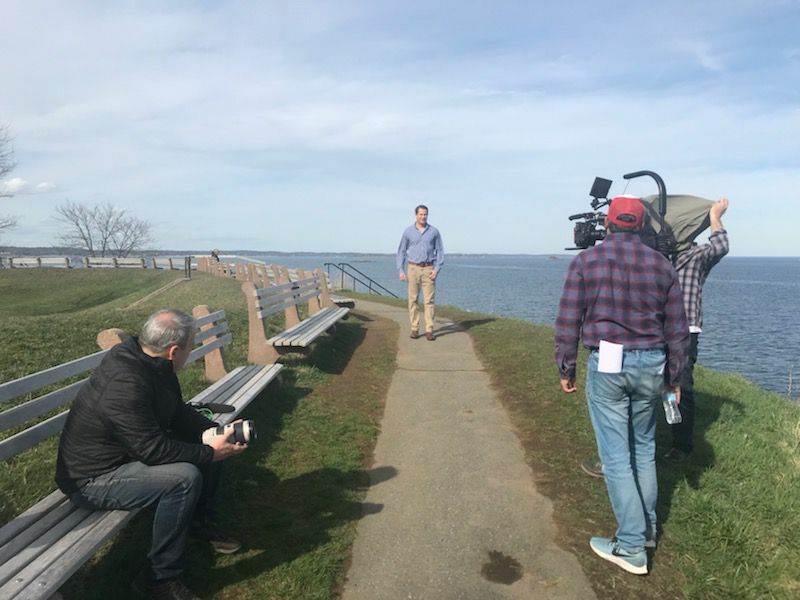 in his hometown of Marblehead, Mass., taping for a presidential announcement that's expected within a week, according to a source close to Moulton. Moulton's key issues will be foreign policy, national security and defense. 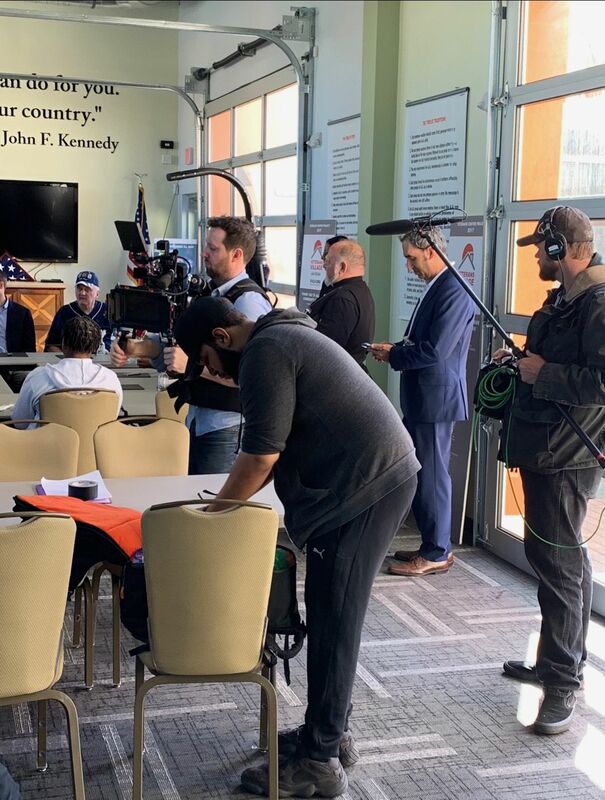 Moulton was also spotted taping recently in Vegas (photo below), where he held three meetings with veterans. Moulton, 40, ran on "bringing a new generation of leadership to Washington." The congressman joined the Marines after graduating from Harvard, and led an infantry platoon in Iraq. His bio says: "He served four tours in a war that he didn’t agree with." Matt Corridoni, a Moulton aide, tells me: "Seth has said he's seriously thinking about running and will announce his decision by the end of the month." Ohio swing voters think that among the younger 2020 candidates, President Trump should be most concerned about Beto O'Rourke — but they're not sure the Democrat can win, Axios' Alexi McCammond reports from Bowling Green. This was a takeaway from an Engagious/FGP focus group last week. Participants were shown two-minute video clips of O'Rourke, Julián Castro, Tulsi Gabbard, and Pete Buttigieg, and asked to score them based on who Trump should be most concerned about heading into his re-election. Castro and Buttigieg tied at 3.8, and Gabbard came in at 2.1. This is amazing: Five of the 12 participants scored Joe Biden a zero on recognizability — as in they had no idea who he was. When they were shown a photo of Joe Biden. After watching videos of the four candidates, the voters were asked to rate the Democratic Party's future, on a scale where zero is "dim" and 10 is "bright." The average score was just over 7, suggesting these swing voters think younger candidates like Beto will carry the party in a positive direction. Some of the biggest names on Wall Street are partnering with climate science groups to produce the first countrywide, property-level maps attempting to financially navigate the age of extreme weather-driven calamity, reports Axios future editor Steve LeVine. Their early conclusion: An all-but oblivious Wall Street is underpricing the risk of intense heat, wildfires, drought, storms and floods to their investments. 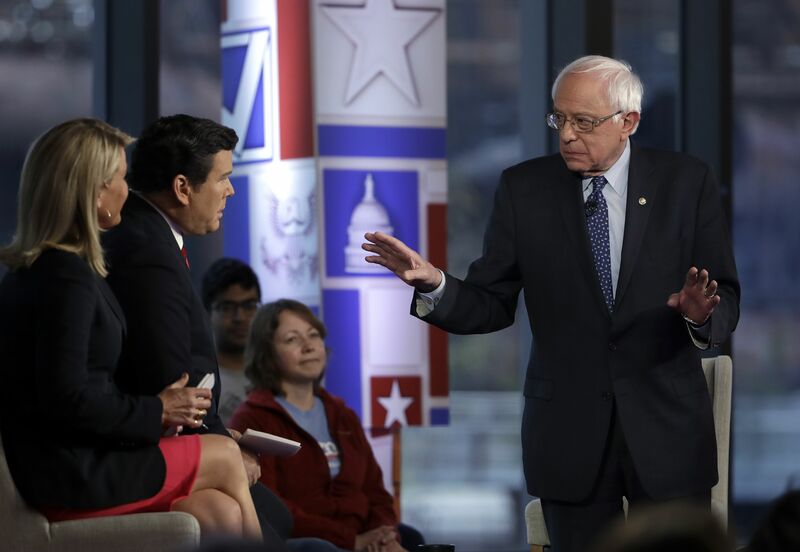 Sen. Bernie Sanders' town hall on Fox News on Monday was the most-watched Democratic event of 2020 so far, AP reports. Nielsen estimates 2.55 million people saw the town hall in Bethlehem, Pa., beating the 1.35 million who saw Sanders on CNN on Feb. 25. Sen. Kamala Harris' CNN town hall in January was seen by 1.95 million viewers, the previous high for a 2020 Dem. Sunday's "Game of Thrones" season premiere was the most-watched one-day event in the history of HBO. 17.4 million watched live on the network at 9 p.m., streamed through HBO’s on-demand service or during two reruns that aired later that night, per AP. Nielsen can't account for people who watched more than once. Why it matters: A casual, ever-coarser culture has embraced a word that once shocked, and now bores. The ultimate epithet is now everyday conversation. What we've lost: A surefire device for cutting through life's white noise. Thank you for reading AM! Get your friends to sign up!